Blog Ep: 258 - Why It's So Hard To Put Those Damn Phones Down! Do you have a really hard time getting away from your phone? Why do we find it so hard to put down our phones? I’ll give you 5 reasons drawn directly from psychological theories on how we learn, how teenagers are strongly affected by reward and how we are all drawn in by mystery. 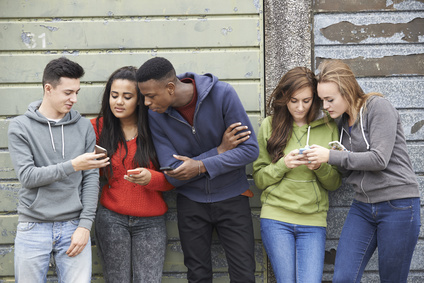 There is of course no easy answer for how to get teens to put down their phones but I’ll share what I’m doing and I invite you to share your thoughts on this topic in the comments below. Variable Interval Reinforcement: One of B.F. Skinner’s methods of getting rats and pigeons to learn (also works with humans). You never know when you’ll get a reward. You don’t necessarily have to do anything (you could just stand around and wait) but eventually you’ll get a reward. This happens with our phones. Eventually you’ll get pinged and you’ll check your phone. Sometimes the ping will signal a reward so you’ll check your phone again. Variable Ratio Reinforcement: the stronger way to get you to repeatedly do something is to reward you not every time you do something, but after you do the behavior an uncertain number of times. Gambling is the best example. You have to keep putting coins into a slot machine – but you never know when you might win. For our phones: you have to do something – like create a text or upload an image or a video – and you never know when exactly you’ll get rewarded (such as a friend seeing it, liking it or telling you how great it is). The Teenage Brain is especially responsive to rewards. The neurotransmitter dopamine that is released when you experience a reward (such as a message from a friend or watching a funny video) is really powerful. Teens get a more powerful sense of pleasure from these rewards than adults do. Thankfully, this means that as we get older we’ll find our phones less compelling. 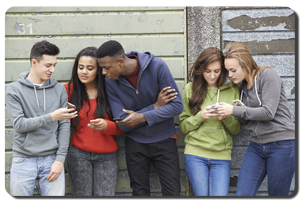 The Teenage Years: a Time of Exploration: according to Erik Erikson, teens are in the “Identity vs. Role Confusion stage and they are actively trying to figure out who they are and where they fit in. They are also naturally afraid of missing out on social events (FOMO). Their cell phone and the internet in general hold this kind of important information for them. Mystery: all of us are drawn in by the unknown and the incomplete. We naturally feel a strong need to resolve mysteries and to solve puzzles. Very often we’re drawn to our phones because of headlines like “You’ll never believe what happens next…”. It’s very hard to resist. Interested in what mobile app developers do to try to hook you on their apps? Check out the book called Hooked. An excellent read with lots of psychological insights. Create Rules around phone use – when phones can and cannot be used. It’s preferable that you do this rule making along with your teen so that you both feel a sense of ownership around the rules. Wowzers. What a great podcast. I might share this with our teenage children. Yea, ground rules are the only way I’ve found to deal with phone use. The factors I discussed in the episode (variable reinforcement, the use of mystery, etc) have such an incredibly powerful effect on the teenage brain. The effect is very similar to gambling and other forms of addiction. Parents really have to help teens manage their phone use. At this stage in their lives the “pull” of the phone is just too difficult for them to manage on their own. Glad you liked the episode and thanks for taking the time to leave a comment Daniel. I was wondering if you would apply the theories to phone “addiction” to other generations (mainly 20s-30s). Would the those in that age range really be affected by the rewards from the phone or is there another factor in play?